On Friday I slaved away in the kitchen for 9 hours (okay, 8 if you take away the trip to Asda to buy energy boosting supplies) baking my Nan a birthday cake. 9 hours does seem a bit long but I wanted it to be perfect and, in my eyes, it is. I decided to use a Madeira Cake recipe as it is like a Victoria Sponge but it's heavier, meaning the cake wouldn't collapse underneath the icing. 1. Preheat the oven to 180C/350F/Gas Mark 4. Grease 2 identical round cake tins, then line the bottoms with grease-proof paper. 3. Beat in the eggs one at a time, adding a tablespoon of flour before the last egg to prevent it from splitting/curdling. 4. Sift in the flour and gently fold it in to the butter mixture, with 2-3 tablespoons of milk so the mixture falls off the spoon. 5. Fold in the lemon zest. 6. Spoon the mixture out evenly between the two cake tins and smooth down the top. 7. Bake in the oven for 25 minutes or until golden brown. Insert a skewer to make sure it's cooked. 8. Once the cakes are baked, take them out of the oven and cool in the tin for 10 minutes before placing them upside down on a cooling rack and leave to cool completely. As the cake is cooling you can get started on the filling! 1. Beat the butter to a smooth/soft consistency in a bowl. 2. Sift in half of the icing sugar and beat it together with the butter until it is smooth. 3. Sift in the rest of the icing sugar and add a tablespoon of milk. Beat until it is all incorporated and the mixture is smooth. 4. If the mixture is a bit thick, add some more milk. 5. Once the cake is cooled completely scrape the buttercream out of the bowl onto one half of the cake and, using a palette knife or the back of a spoon, smooth down until it is completely level. Don't forget to take it to the edges! 6. On the other half of the cake, scoop out two tablespoons of jam and smooth down onto the cake using the back of a spoon. You can use more jam if you require it. 7. Carefully put the jam half of the cake on top of the buttercream half. 8. Put the cake in the fridge for 20 minutes so the cake can set a little. You can either leave it there and eat it or if you plan on using this recipe as a birthday cake then you have two choices to make. You can either cover the entire cake with jam using a pastry brush or you can make some more buttercream (half of the above recipe) and cover the cake with that. It is essential that you cover it with something, albeit jam or buttercream, as the icing needs something to stick to! 2 x Regalice Fondant Icing in Lilac (250g x 2) - £2.29 each, click here to view online. 1 x Renshaw Professional Fondant Icing in Duck Egg (250g) - £2.29, click here to view online. Wilton Flower Fondant Cut-Outs - £3.29, click here to view online. Culpitt Round Cakedrum, 12 inches - £2.99, click here to view online. I also bought Ready to Roll White Fondant Icing in ASDA for £1.33, click here to view online. You don't have to buy these things, of course. You can buy different icing (there is loads of colours to choose from!) and you can buy different cutters in a variety of different shapes but I chose these as I thought my nan would like them the most. You can also buy plain white icing and colour it using a paste food colouring but I bought mine ready-coloured as I didn't have time. 1. Clean and dry a work surface then shake some icing sugar where you will be working. 2. Open the packet(s) of the icing you will be working with and squash them together. Knead them for 2 minutes then squish it into a ball. 3. Sprinkle some icing sugar onto a rolling pin then carefully roll out your icing. DO NOT turn the icing over, roll only one side. Keep moving it as you roll to ensure it doesn't get stuck to the work surface. Count how many times you roll, for example, roll it 4 times to each corner then think about whether or not it will cover your cake. It took me three attempts to get this correct, for the first two times I rolled it out too thin and it broke when I tried to pick it up. 4. Once you have rolled it enough for it to cover the cake, carefully pick it up and drape it over the cake. 5. Smooth down the top of the icing with your hand, ensure you do it gently so you don't accidentally make holes in the icing or rip it. 6. When you smooth down the icing on the sides, brush your hand upwards, not downwards. If you brush the icing downwards with your hand you will be stretching the icing at the top. 7. Cut off any excess icing and keep it to one side for your decorations. At this point your cake should be nicely covered with your base icing! 1. Rip off small parts of the other icing colours you have and roll them out. 2. With your cutters, cut out different size flowers/hearts/etc in all of the different colours so you have more of a variety. 3. Roll the excess icing into a ball and cover with separate pieces of clingflim, along with the rest of your icing. This is so you don't dry out the icing and you can use it again another day. 4. Fill up a small cup/jug with a bit of cold water and dip a pastry brush into it. Ensure you knock off the excess water before brushing the flowers/hearts/etc with water. You can then stick the icing together to have little flowers on top of middle sized flowers on top of big flowers etc. You can have loads of different variations so have a little play with it. Please make sure you don't use too much water on the icing: this will make the icing very weak and it could fall apart. It also stays and drips down on the cake and you'll have water stains. It's also worth waiting a few minutes before you place them onto the cake, just to make sure the decorations stay stuck together and harden a little. It's also worth noting that the longer you leave the icing decorations out the more they will harden. This is good as they won't break as easy. 5. Very carefully place the decorations onto the cake, the backs of them brushed with a little water. Hold them onto the cake for a few seconds, just to make sure they stay in place. 6. Repeat 4 and 5 until you have a cake covered in icing decorations! 7. Photograph cake, feel a sense of pride and wish you didn't have to give it away! I took this to my Nan's on Saturday afternoon. She cried with pride. I nearly cried when I put it down and saw some-one had already given her a birthday cake. Last week I decided to paint my nails after 2 weeks of going without painting them to give them a bit of a rest. I decided to try gradient glitter nails by using one of the nail varnishes I haven't used before, OPI's Nail Lacquer in Spark De Triomphe. OPI's Spark De Triomphe is a clear nail varnish that is jammed packed with small and large specs of gold/green coloured glitter. It's one of those nail varnishes that makes you unable to stop staring at your nails. I used the Sally Hansen Base Coat, let it dry, then I applied two layers of Berry by Barry M and let it dry. I then applied a thin layer of Spark De Triomphe 3/4 of the way up, then I applied a slightly thicker layer 1/2 of the way up then I put on two layers of it to the tips. I then applied 2 layers of top coat then wa-la! You can do this with any base colour and any glitter colour. 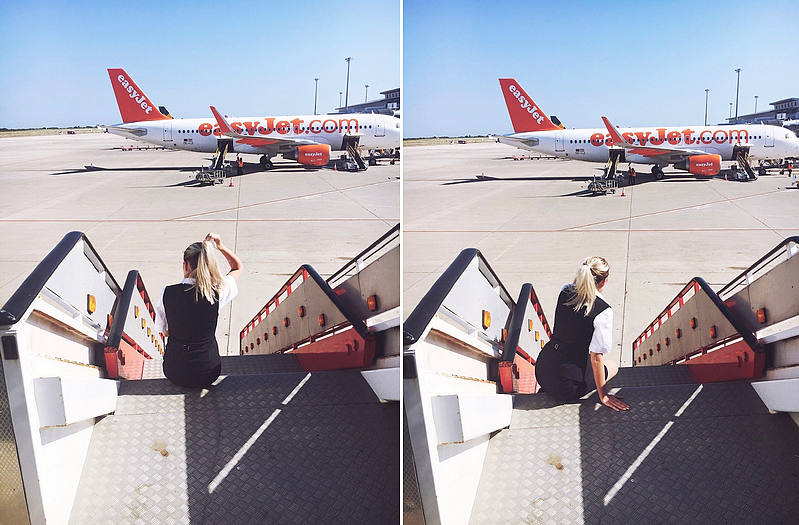 The possibilities go on and on! I am forever on the hunt for a new eye liner so when I saw Avon's Extra Lasting Liquid Eye Liner Pen recently I thought it would be worth a try. I bought this in the shade Black for about £5 when it was in the sale. It comes with the nib which I find the most easiest to use when it comes to liquid eyeliners which is a felt tip nib. It is so easy to apply with the nib as you can create a nice little flick to the outer corners of the eyes. Unfortunately that is as good as this eye liner gets. Like I said before, I bought this in the shade black. Unfortunately, this is not a black eye liner. It is incredibly watery and comes out a grey colour when swatched. I had to let it dry then apply another few layers of the eye liner to get a kind-of dark grey colour. Another low-point to this eye liner is that it does NOT last all day. In fact, it lasts all of about 3 minutes. Literally. The first time I used it I actually thought I was going mad as I applied it, did something else for a few minutes then just happened to glance in the mirror and, "oh wait, where has my eye liner gone??!" It had faded away within minutes. I also swatched this on my hand then tested it out with water - as soon as the eye liner had contact with water it faded away. Very poor indeed. Imagine going out wearing this in the rain. All in all, a very, very, poor eye liner. I was very disappointed with this eye liner and I can't urge you all to stay away from it more. I'm really sorry Avon - I love your eye liners but this one just doesn't work. I love ASOS so when I started searching through their website earlier I soon realised that I actually wanted pretty much everything I saw. Here's a few of the items I want the most! 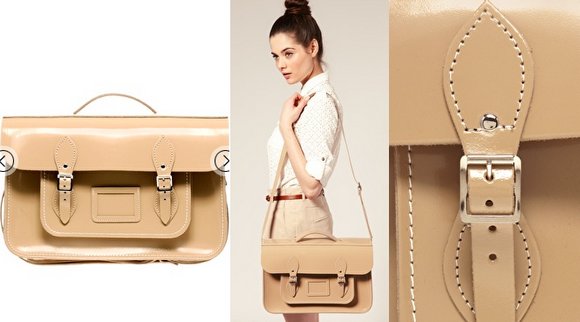 I want this bag SO much it's unreal. If I could buy this without worrying about the price then I would do! 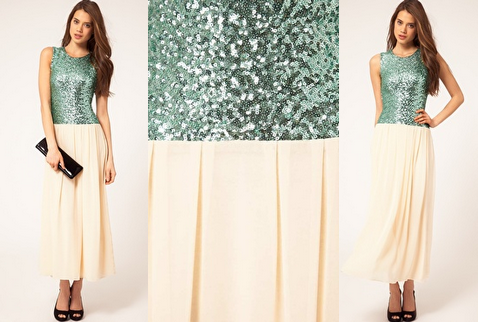 I think this dress is gorgeous. I wish I could be invited somewhere special for an excuse to buy it! 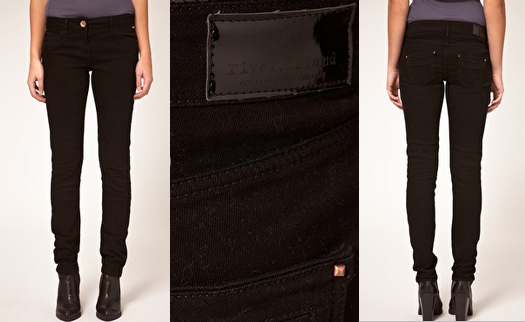 I really need some black jeans of some sort so I will definitely be buying these! 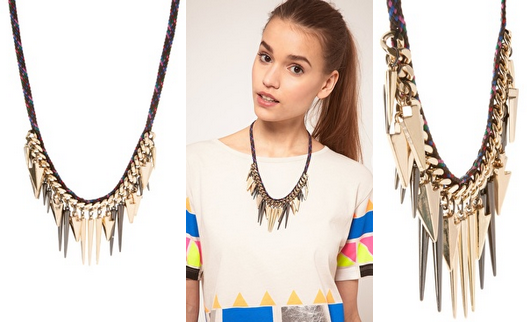 I really love this necklace but at the moment £25 is a lot of money to spend on a necklace. 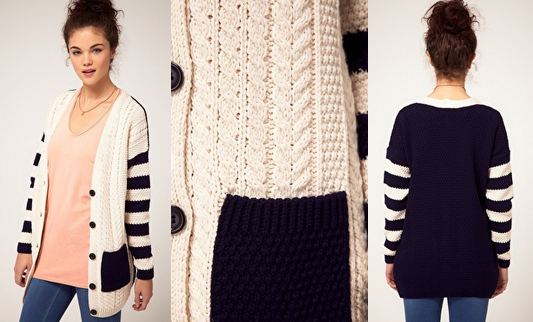 You can never have too many cardigans! I love this jumper, I can imagine me wearing it on a chilly night in the summer with shorts. I already have some flatforms that are lace up and I think these would go really well with everything that I own. That's my justification for buying them anyway! Some one please give me an excuse for buying this skirt!! I have been plucking up the courage to buy these sunglasses for a few years now so I am finally going to buy them this year! They're not going to get any cheaper so I may as well just buy them and chuck the lookalikes from Primark away! As I'm going to Cyprus in June I'll be needing a swim suit of some sort and I think this is the perfect one for me. I know it won't be to everyone's tastes but I love it! £69 is a lot to pay for a swimsuit though, so hopefully I'll come across a look-a-like some where. I'll start saving now, just in case! Look how sparkly they are!! I love these, at the moment all I seem to wear is leggings and these would be perfect for slobbing around the house parties! Last week I wanted pink nails but it didn't quite turn out how I wanted it to so I took it off and decided to do leopard print - again! All I did was paint Peach Melba on my nails on top of a base coat, then put a few random spots and splodges on my nails and wa-la! Not my neatest 'work' as I do always get nail varnish everywhere but I thought it was a little different. It is SO easy to do, I can't believe I didn't buy a nail art pen sooner! Boots are currently doing an offer where if you buy two Model's Own Nail Varnishes you can get their nail art pen for free. Also, you can buy 3 Model's Own Nail Varnishes for £12 on Motel's website here. I may have to take up that offer! A week ago I was looking through my cupboard, a place where I keep make-up, beauty products, hair products that I've never used, perfume, DVD'S and an old Gameboy cira 1990, I realised how much stuff I have. Stuff meaning crap that I have never used/touched/looked at and it's about time I used some of it up. So, until it is all gone I won't be buying any more crap stuff. My cupboard won't take any more beauty products, so much so that my moisturisers are currently chilling out on top of my Gavin and Stacey boxsets, a thought that makes me shudder as, in my mind, everything should be together in groups then height and alphabetical order. Let's have a little look at the items that I aim to use up by this time next month. VO5 Curl Boost Curl Scrunching Spray - I spray, I scrunch, I pray. This does not make my hair wavy in the slightest. I wanted beachy waves, I am not getting beachy waves. I bought this about 2 years ago after seeing a friend use it on her hair which made her hair all lovely and wavy so I'll have to battle on with this. I WILL get beachy waves VO5, I will! AVON Hawaiian Shores Body Mist - A lovely body spray that I've neglected recently after receiving a few bottles of perfume for Christmas. I've used 1/4 already so if I bathe in this every day for a month then I may finish the bottle. Mary-Kate and Ashley L.A Style Perfume Spray - I think this was the first perfume I've ever received! This is actually my sister's bottle that she was going to throw out but there's 1/4 left and I thought it was a shame to throw away. I don't even really like the smell, it smells like me when I was about 10. Clearasil Deep Pore Treatment Wash - Only used a few times and I've already broken the pump! I'm not sure how I'm going to get the product out but I'll give it a go. Garnier Texturising Gum - I've only used a very small amount of this and to be honest I'm stick of the sight of this tub! I bought this a few years ago (product hoarder alert!) when I was after scene hair, something which I never accomplished thank the lord. I'm not entirely sure how I'll use this in my hair but I'll try and use it all up. Max Factor Colour Adapt Foundation in Creamy Ivory - I have far too many half used foundations in my make up box so it's times I used them. I much prefer wearing this when paired with my Maybelline Dream Matte Mousse Foundation as it gives me a fuller coverage. George Big It Up Mascara - A lovely mascara that makes my eyelashes appear longer. I need this gone so I can start on one of the other mascaras that I own. MUA Blusher in Shade 3 - A rosy pink blusher that makes me look like I've just stepped in from the cold when I wear it. I love it but I'd like to use it up so I can try a different shade from their range. AVON Glimmerstick Liqui-Glide Eyeliner in Graphite - A gorgeous grey eyeliner that glides onto my eyelids like a dream, unfortunately the formula for this is quite poor. The first time I used this, half of the eyeliner in the retractable stick broke and everytime I wear it now it brakes or smushes. I'd like to use this all up, as much as I love the colour it is very poor. AVON Extra Lasting Liquid Eyeliner - An eyeliner with a felt tip nib, it had so much potential but it is incredibly poor. The black colour is barely there and so much for 'extra lasting' - it comes off after about 10 minutes. I'll use this underneath another eyeliner as a guide for a cat flick as I do like the felt tip end. Otherwise, I want it gone! I hope I manage to use these products up this month, some of them I know I won't use up completely but if I use up even a small portion of it I will be happy! In case you are unfamiliar with the phrase 'Shopping the Stash' it means that you go through your make-up collection and decide a few products to use that day/month/year that you forgot you had. For instance, when I went through my make-up collection I kept finding myself say "oooh, that looks nice", just like how I would say if I had seen it in a shop. These are the products that I've chosen to use this week! This foundation will be going on the list of products that I plan on using up this month but since I started using it again (which was like 2 days ago) I've realised how much I love this foundation when used with the Dream Matte Mousse foundation. It gives me more coverage when used together and I really love the results they give. My favourite foundation and a new re-purchase, this foundation gives my oily skin a lovely matte look and gives me just the right amount of coverage that I need. This week I will just be using the blusher from this duo. This blusher is a lovely pink with a hint of coral, the perfect alternative to a plain pink blusher. I'll be using Ivory Coast as a base throughout the week and I'll be using Mardi Gras underneath Chromed Cocoa for a smoky eye. A gorgeous gold with a hint of sparkle, it's ridiculously pigmented so I'll either wear it on it's own or with Mardi Gras. Matches my eyebrows perfectly so they appear natural and full. Doesn't match my eyebrows at all but since dying my hair dark brown it does make my eyebrows match my hair which is a good thing! Perfect for when I'm in a hurry. A lovely lip cream which is very creamy and leaves my lips looking a peachy matte. Another matte lip product! Glides on easily and leaves me with mauvey pink matte lips. I have been looking for the perfect eyeliner for 2 years now. I think I've pretty much tried everything. I thought the Maybelline 24H Gel Eyeliner might have been it but alas, it was not. 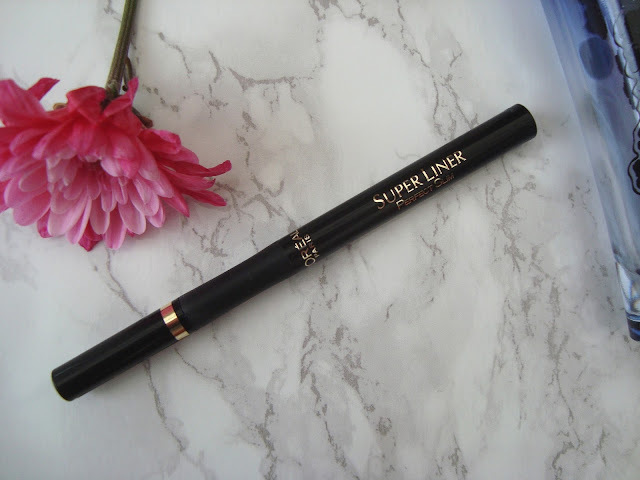 I started to give up hope.. well, that is, until I found this - the L'oreal Super Liner Perfect Slim Eyeliner in Intense Black. The eyeliner "brush" is that of a felt tip pen. I personally love this whole idea of drawing on my eye lids with a pen so I really like it. 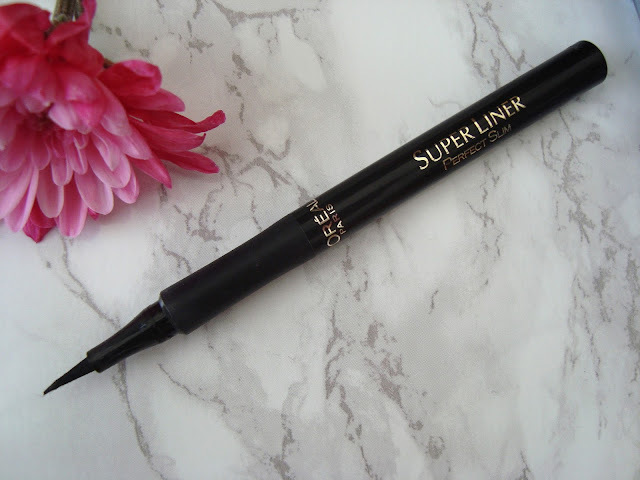 It's thin enough to do a thin line but you can also angle it to get a bolder liner too, the best of both worlds! It is SO easy to apply - usually I have a hard time creating a cat flick but every day since I've used this pen I've found it so much easier to create straight lines and cat flicks. I also absolutely love how the eyeliner doesn't transfer onto the top of my eyelids - a rarity, it would seem. It also lasts ALL DAY without even fading. Amazing. I could not sing this eyeliners praises enough if I tried. A while ago I made an order on Beauty Joint where I bought the NYX Rogue Cream Blush in Glow, a lovely warm pink shade which leaves you with a pretty pink cheeks. Before buying this I had never really used a cream blusher before. I had used the Sally Hansen Sheerest Cream Blush (review here) but that isn't really a cream blusher as it's very chalky so adding this blusher to my collection was a nice change. It is incredibly creamy which is an understandable criteria when you buy a cream blush! I use my fingers when applying this so I can control how much product I put on as this blusher is incredibly pigmented and it would be very easy to go OTT with it. This blusher leaves a natural dewy look on the skin but what you have to remember with this is that less is more! Although, because it is a cream blusher, it's very easy to blend in or build up so you can smooth down any heavy-handedness or build it up for an intense look. 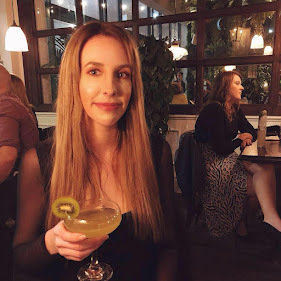 I've managed to get about 5 hours wear out of this blusher before it faded away so if you were to wear it for a day out you would have to remember to take it with you to have a little touch up! I completely love this blusher, it's one of the blushers I've been wearing the most recently. It leaves my cheeks with a lovely, dewy natural pinky glow. This is a bit of a fail tutorial. It was supposed to be leopard print but they didn't turn out too well. I used a China Glaze Nail Varnish as an accent nail, purely because I had worn it the week before and I couldn't bear to take it all off! I used two coats of Barry M's Nail Paint in Cyan Blue and it dried within no time. Then I put a few splodges of the white varnish on, let it dry, then went round a few of the splodges with the nail art pen. Very simple. Then I put a top coat on top and smudged a few of the nails which is the way the cookie crumbles.